after many hours of trying to fix this mysterious issue I decided to reach out for help. Thanks to everyone willing to aid me. When I send HTML emails from Woocommerce, those emails are received broken. It seems like Woocommerce adds many = characters spread randomly inside the code and text. I did managed to locate something, that is probably causing the problem. When I go to email template (lets say customer-on-hold-order.php) and delete line with action woocommerce_email_order_details; It suddenly start working again. The received email is OK. But I need to send the order details, deleting it permanently is a no go. Also, the issue is with all woocommerce email templates, therefore I assume, that there must be some problem with email composition at the point where it adds the order details to the email. 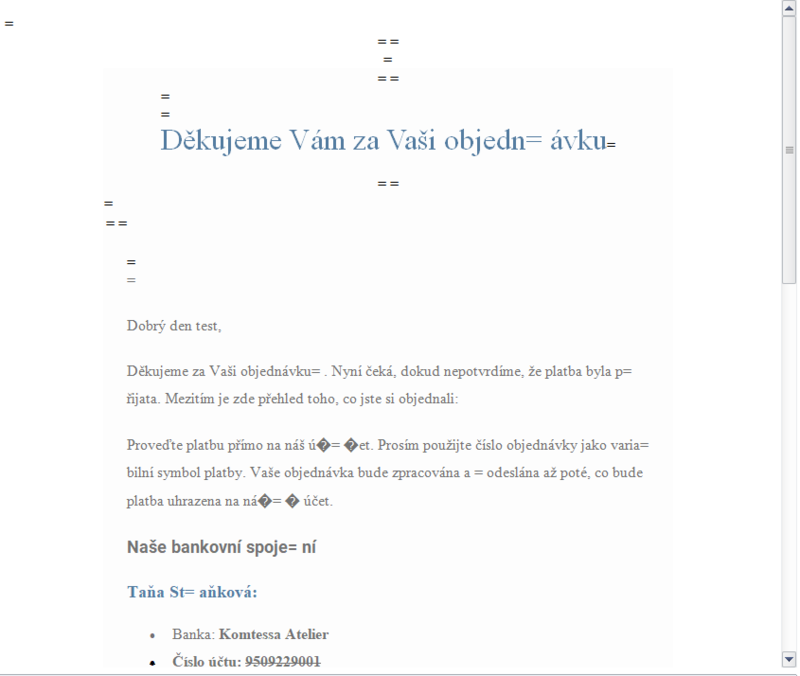 And when I check the email preview within wordpress, its OK. And it breaks only after sending. Browse other questions tagged woocommerce email html-email or ask your own question.